I am a person who looks for information on the types of things that are on your site. I like to know the real truths and origins of things like this but, where do you get this type of information from. Like for instance, about things that are not in the bible. God had man create the bible so we can know the truth but I see more information about all these people and supernatural beings and I would like to know who, where, and how this information came to be. We know this because the bible wasn’t created by one person at one time. It came to be over the course of hundreds of years and was penned by numerous authors who lived at various times during history and each wrote from specific perspectives about events they were dealing with. We know that most of the people mentioned in the bible – the Egyptians, Babylonians, Greeks, Romans, etc were real people with their own cities and writing systems. Many of them wrote their own histories, which we still have. Archaeologists spend years and years excavating ancient ruins and report their findings – from building architecture, to artwork, to how burials were placed, to where they worshiped, to how they waged war, to what they ate – and then speculate from these findings and the records we have what kinds of people they were, who they interacted with, their political, social, and religious structure, etc. There are also numerous biblical archaeologists who do the same for the Israelites or early Christians. We know that there were many different ideas circulating – many commentaries on the bible. There are numerous stories collected by rabbis called the Midrash, a collection of Jewish laws called the Talmud, and a collection of early Christian rituals called the Didache. 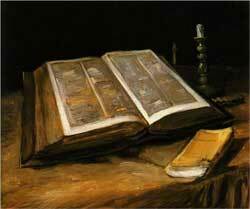 There are numerous books that didn’t make it into the bible – both Jewish and Christian. There are many people that wrote extensively about life in antiquity or against heretics like Josephus, Philo of Alexandria or the Early Church Fathers. Early writings from the first centuries like the Dead Sea Scrolls and the Nag Hammadi library have recently been found in the last century that have shed light on what happened. Remember, the bible as we currently have it wasn’t formed until the 4th century. Prof. Bart Ehrman does an excellent job recounting the debate between early sects of Christianity during the first few centuries in his book, Lost Christianities. And that’s all just from antiquity. We have numerous writings from the Medieval and Renaissance – the Protestant Reformation, prominent Jewish and Christian mystics and Kabbalists, “offical” doctrine of the Catholic Church, the Anglican church, the Greek Orthodox church, reformers like Martin Luther, John Calvin – the list goes on and on. We also have plays and poetry inspired by religious beliefs – like Dante’s Divine Comedy, John Milton’s Paradise Lost, the Faust myth, etc. So, to answer your question, we know by piecing all the various writings and archaeological finds from the last 3000-5000 years or so together into a big picture and looking at beliefs in their historical context and how they evolved over time. I’ve listed the sources for my info within the various writings – you can find most of the primary texts in the links mentioned above or over at the Internet Sacred Text Archive. Twilit Grotto is also a great source for western esoteric/mystic texts.